Break the pots if you need to refill your hearts, then go right. Drop a bomb against the top wall and go up. Get rid of the two enemies with the shield, then the sword. Then pick up the Compass in the chest and go left. Be careful with the enemy and go down the stairs. Go left, climb the stairs, then go southeast in the next room. Get into the cart and buckle your pants! Then go left twice. Drop a bomb against the left wall and go ahead. 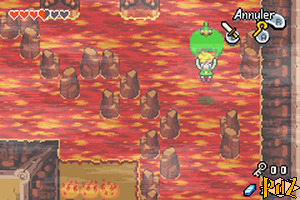 Get rid of the four enemies by hitting their back to make a pedestal appear. Shrink, go on to the top right, then right twice and down twice. Go on left, jump and grow back. Climb the stairs and you will get the Map from the chest on the right. Go down the stairs again and walk without stopping on the lava platforms. Go left, pick up a Kinstone from the chest and walk on the switch. Go back on the lava platforms to reach the southern gate. Get on the block to go across, then hit the enemies, lift them and put them in the holes by tossing them or by going into the holes. Pick up 50 rupees in the chest, then climb the stairs. Jump into the tornado, then fly to the other one southwards, then northeast. Step on the switch, push the block to leave, then push the chest in the hole to the left. Pick up the Small Key, then go up, right twice and get back into the cart. Open the door, walk on the rail tracks, switch the lever with the sword and get back into the cart. Go left, top and carefully walk on the rail tracks. Blow up the wall between the two pots, go down, pick up the Piece of Heart, come back up and go on up. Jump, get rid of the silver blobs with bombs or the Spin Attack, then you will find the Cane of Pacci in the chest! and go left. Get on the platform, use the Cane of Pacci to flip the next one and go across quickly! Get close to the hole, use the Cane of Pacci, then go ahead and jump higher. Walk on the switch and go down. Use the Cane of Pacci to flip the cart and get into it. Push the chest into the hole, pick up the Small Key and get back into the cart. Go back up, jump and open the door. Shrink on the pedestal, then go left. Go across the room, get back to your size, flip the cart and get into it. Switch the lever and get back into it. Hit the four enemies and put them in the four holes at the bottom. Then, pull and push the lever into the hole, then switch it on. Climb the stairs and go up. Go up, jump and open the chest to get another Kinstone. Push the block, use the Cane of Pacci on the hole and jump. Pick up another Kinstone, then go right. 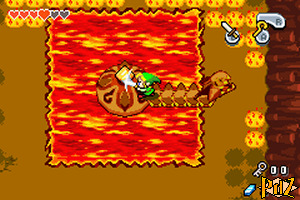 Hit the small flames with the sword, then when the moving platform is going to the top, walk on the first platform, flip the second one and quickly go right! Walk on the switch to create a second warp tile, then cross again thanks to the two platforms. Go back on the first one, then on the second one, but this time to go down, flip the third platform, go ahead, then on the fourth and quickly go up! Vacuum the pots to the top, step on the next platform and go to the pots. Step on the next platform to the top, go on the following four and go up. Climb the stairs, jump, go right, pick up the Kinstone from the chest and go back to the left. Use the Cane of Pacci on the other hole and jump. Use the Cane of Pacci again on the hole, jump into the tornado and fly to the top. Go right, jump into the tornado and fly southwest. Go left and down. Jump into the next tornado, fly south, get into another tornado and fly south again. Pick up 100 rupees in the chest, then jump, use the Cane of Pacci on the hole and jump northwest. Use the Cane of Pacci again and climb on the central higher zone. Jump into the tornado, get into the following ones by taking note of the shadows, and fly west. Once you get the Kinstone, jump into the tornado at the top and jump northeast, towards the big chest. 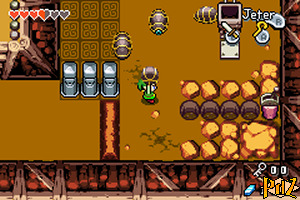 Pick up the Big Key from it, then jump and open the boss door at the top. Break the pots to refill your hearts, put a Small Fairy in your bottle and jump. To defeat this dragon, be fast, but don't panic! Try to get on one of its sides and use the Cane of Pacci on it. If you were fast enough, its body will be upside down and its head will fall. Go quickly on its neck, hit three to four times its body with your sword, then quickly go back to the sides of the room. Try your best to avoid its flames and rocks. 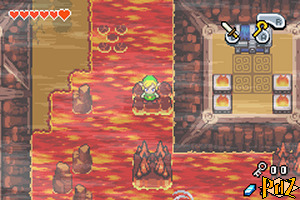 If the lava spreads from the middle, stay near the edges and use the sword on the flames to maybe get some hearts. Do this tactic three to four times and the boss will be defeated. You are then rewarded with the Fire Element. Pick up the Heart Container, then step on the warp tile.